Price: $600,000 : 3 Bedroom, 2 Bath : 580 Sq. 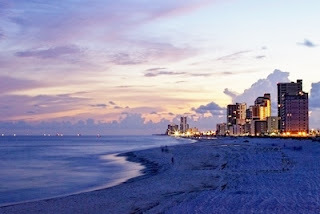 Ft.
Gulf-front condominium home in Panama City Beach Florida - this resort property is perfect as a second home and the income potential makes it a great real estate investment. Well-thought out floor plan decor with the open spaces 8 or more people comfortable. The exceptional/casual feel will put you at ease the moment you step through the door. You'll be glad to call this residence home whenever you are at the beach. Enjoy the gourmet kitchen featuring granite counter-tops and stainless steel appliances. It comes complete with everything you need to utilize culinary skills. Perfect for a family get-together, entertaining good friends or just a quiet, relaxing evening with the Gulf of Mexico as the back-drop. Celebrate the evening sunsets and welcome the morning sunrise from a the private balcony. This property comes with the perfect place to soak in the stunning scenery of famous white sand beaches and emerald waters as you enjoy resort living with first-class amenities including a fitness center, concierge service, a high-rise terrace pool with water spas and covered parking, a beach-side luxury pool with water spas and a full service tiki bar for your enjoyment. The beautiful beachfront complex offers impressive architecture and luxurious accommodations.